Raluca Grosescu and Raluca Ursachi, “The Romanian Revolution in Court: What Narratives about 1989?” in Vladimir Tismaneanu and Bogdan C. Iacob, Remembrance, History, and Justice. Coming to terms with traumatic pasts in democratic societies. (New York: Central European University Press, 2015), pp. 257-293. In this series, we will look at parts of the Grosescu and Ursachi chapter that necessitate exposition–exposition that is easily derived from my prior research and publications. In episode one , we looked at Grosescu and Ursachi’s understanding of “plan ZZ,” which Grosescu and Ursachi suggest was a “fantasy scenario” of somehow abstruse allegations invented for the purposes of the initial post-December 1989 trials: https://romanianrevolutionofdecember1989.com/grosescu-and-ursachi-the-romanian-revolution-in-court-i-annotated/ . In episode two, we look at what is a favorite, seemingly universal assumption that has gone unresearched by Romanianists: the rumor that the “water was poisoned.” While it is true that this was primarily a piece of disinformation to create panic and confusion–they totally misunderstand who fed it and to what end it was used. Moreover, they clearly have no knowledge of Belgian toxicologist Aubin Heyndrickx‘s toxicology report on what happened in Sibiu 20-22 December 1989, and why this rumor was not completely a “fantasy scenario” as the authors smugly suggest: https://romanianrevolutionofdecember1989.com/grosescu-and-ursachi-the-romanian-revolution-in-court-annotated-ii-the-water-is-poisoned/. In this episode, we examine the lack of questioning and downright gullibility that is so characteristic of anti-Iliescu partisans in Romania: their suspicion and dislike of Iliescu is so strong that they accept at face value absurd claims and fail to question the source of those claims and the motives of the source. Now, even if one thinks that Iliescu either orchestrated or intentionally let the violence linger in order to consolidate a revolutionary image and seize power, how plausible does anybody think it is that he would have said such a transparent phrase out loud? Anybody supposedly so evil and dastardly enough to allow the killing of hundreds and wounding of thousands to take place for his own benefit and to allegedly hide his hand in it all, is highly unlikely to say such a thing. 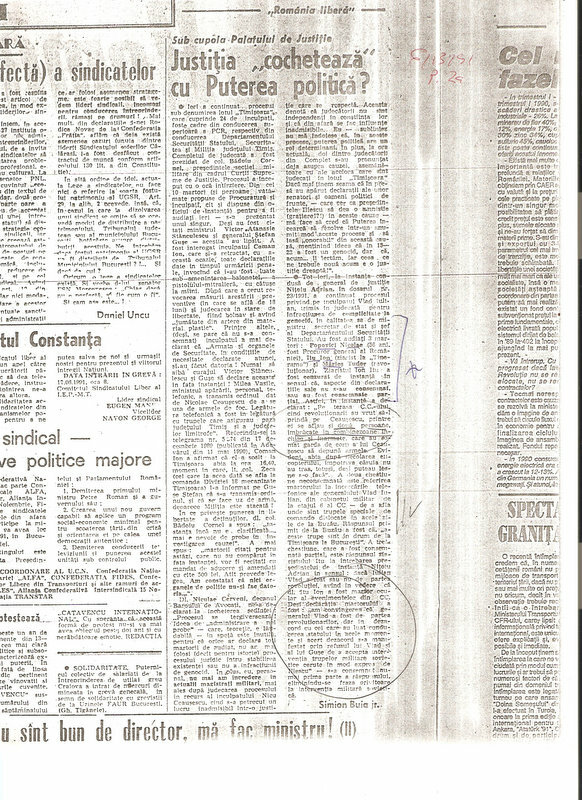 Later, the authors conclude the body of their chapter, by quoting Maries: whereas they seek to deconstruct what they term the ridiculous theories about “obscure, ‘terrorist’ forces,” no such probing analysis occurs with regard to the claims of those who accuse Iliescu and those around him of being responsible for the bloodshed after 22 December–suggesting clearly where the authors stand. Are the interests and credibility of Teodor Maries, head of the 21 December Association, ever explored? Of course not. And why not? After all, does anyone think the likes of Vladimir Tismaneanu, Tom Gallagher, Lavinia Stan, or Grigore Pop-Eleches, to name but a few, would explore those fundamental questions?